Pollarding is an annual process that usually farms will execute. Also it is used in the Europe as there are seasons. Topping cut are not a good practice as it cause various problems for the tree. 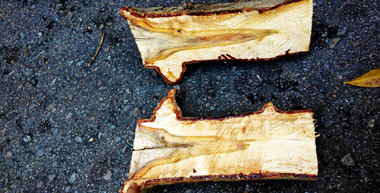 This dissected section of a topping cut shows new shoots growth not attached to the wood, causing future problems. The discoloration also sets into the branch. Poor tree is fighting to defense itself against pathogens. ISA Certified Arborist in Singapore still manage street trees that their contractor is implementing. We should review the curriculum of a certified arborist.